Non-surgical skin tightening is becoming popular day by day. This is not surprising. Comparing to plastic surgery or Botox injections, non-surgical skin tightening has obvious advantages. What Makes Cosmetic Skin Tightening so Popular? First, this is absolutely painless and safe procedure. It does not require any anesthesia, and it won’t damage a skin layer as no needles needed. Second, unlike dramatic plastic surgery, skin tightening does not require a downtown. Third, skin tightening stimulates the natural biological processes in our body. Before ordering a device, you need to know what kind of functions you want to see in your machine. There are stationary and portable skin tightening machines. The portable machines are perfect for the beauty salons with limited space. 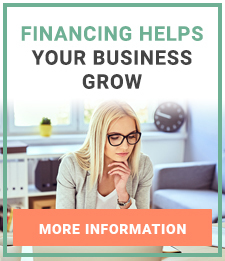 This is a great investment in the future of your business. You’ll have a fashion skin tightening machine with a number of different functions. Plus, it won’t occupy a lot of space. 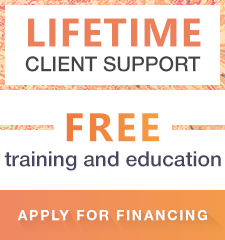 But be sure, it will bring new clients. The portable machines can serve as a skin tightening machine for home use. A good idea for those who care about facial skin, but prefer to do it at home. The stationary machines are suited for big beauty salons as they need additional space, yet such machines look very stylish. They may have additional devices such as magnifying lamps or special space for towels. Skin tightening machine is a good investment in your business. When buying the skin tightening machine, you receive a technically sophisticated device that includes different functions. These procedures are extremely popular and effective. You can be sure that such purchase will bring you income really soon. Let’s more precisely look at the most popular procedures. Radiofrequency is a popular and super effective method of skin tightening and rejuvenation. How does RF energy work? During the RF procedure, the electric current goes through the tissues, and heats them. The collagen and elastin are two substances that ensure the young and tighten facial skin. Both these substances look like crimped helical spirals.With age these spirals become less tighten. The collagen and elastin are both of protein nature. As any protein, they tighten under the influence of heat. Radiofrequency launches natural biological process in the facial and body skin. There are different types of radiofrequency handpieces. They can be monopolar, bipolar, and multipolar. Monopolar RF machine uses one RF electrode to deliver an electric current. It is vertical penetration, and it goes very deep. It can be used for the treatment of facial and body skin tightening, as it affects the skin and subcutaneous fat. Bipolar RF machine uses two closely located electrodes, too close to cause deep penetration. The electric current goes from one electrode through the tissue and back to another electrode. Therefore, bipolar energy is less deep, comparing to monopolar energy. There also tripolar, sixpolar and multipolar RF machines. One multipolar handpiece consists of 3 or 5 or more electrodes, but only two of them work simultaneously. It depends on the area treated, the age of a client and general skin condition. For the maximum result of the facial RF from 8 to 12 sessions required. The duration of every facial RF procedure is around 30 minutes. There is one more specifically nice thing about RF treatment. The results are noticeable after the very first procedure with growing results during the next six months. Microcurrent, also known as a non-surgical facelift, is a safe and effective procedure both for anti-aging and preventive purposes. While radiofrequency is focused on collagen and elastin, microcurrent is focused on muscles. It stimulates the top layer of facial skin and the muscles. 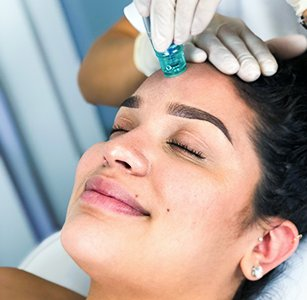 In order to stimulate facial muscles, an esthetician uses two metal prongs that deliver electric current back and forth. Microcurrent procedure strengthens the facial muscles, improves muscle tone, circulation, elasticity and skin hydration. 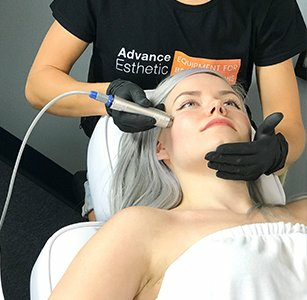 It is a non-invasive procedure, and currents are too low to hurt the facial skin, yet a lot of clients feeling relaxed during the microcurrent procedure. Comparing to the RF procedure, microcurrent lasts a little bit longer. It takes within 45-60 minutes. The results of microcurrent are noticeable after the very first procedure. An esthetician may prescribe from 6 to 12 sessions with one or two sessions per week for the maximum results. It is important to fix the results and have a procedure on a monthly basis. As the RF treatments, microcurrent is not recommended for pregnant women and people with heart problems. The safety question is crucial when buying the skin tightening machines. These machines give the real skin tightening result leaving no scars and sutures. What does it mean? It means that the machines we sell are approved by the Food and Drugs Administration of the United States of America. Despite the fact that skin tightening machines are safe, there are some contraindications for its usage. It strictly not recommended for individuals with tumors, skin inflammation, and cardiac pacemaker. It is not recommended for pregnant and breastfeeding women. We have been in the beauty business for more than 10 years. We use our experience to make your business work more efficiently. How? We develop our own user manuals to make your work with the professional skin tightening machines super convenient. On our website, you can choose and buy the best skin tightening machine for your business. We offer the skin tightening machines for sale of the leading brands, such as Nevada Spa, Zemits, Spa Classics and many others. If you wish to have a close look at the tightening skin equipment, it is not a problem. We are opening a showroom in Los Angeles soon.